Every once in a while, I have to try something a little “left field”. What if, I thought, instead of stitching a panorama or vertorama of a landscape, I tried stitching a 180 degree vertorama of stars. I have stitched a landscape shot with a star shot before as shown in the image “Above and Below”. For “Above and Below” I combined a stack of star trails with a shot from just before dark of the landscape. Unfortunately after stacking the star trail for the top, I found none of my image tools could be convinced to stitch the portions of the image together satisfactorily and the two halves of the whole lay dormant in the bit bucket bin. The star shot – that is the top half – is very similar to this shot on Flickr. I opted to use a stack with fewer frames to keep the sky dark and let the smear of the Milky Way stand out. I then very crudely combined the two shots using the “Collage” tool in Picasa3. I followed the crude paste up job with the “touch up” tool to blend the seam lines. The touch up tool is a crude approximation of the Photoshop Healing Tool and Clone tool combined into one. Sometimes it is very effective, sometimes not so much. 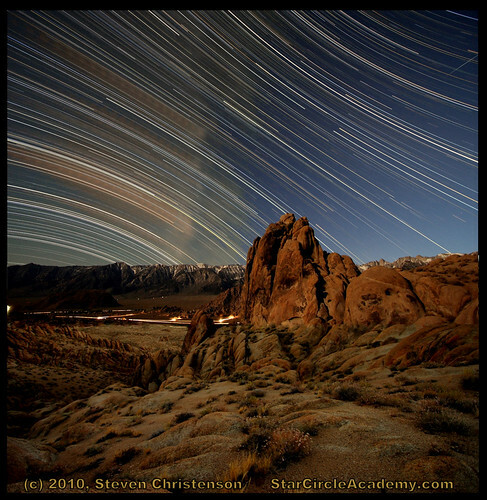 But one evening I found myself staring at the dark skies at 9,000 feet above the town of Bishop, California. 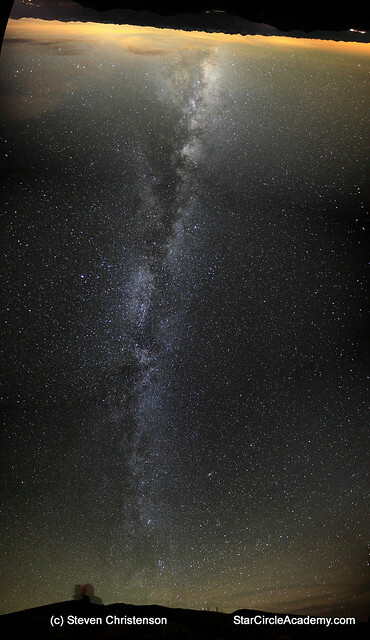 The Milky Way stretched from horizon to horizon and was nearly directly overhead. So I thought I’d try something that I expected to be difficult… but proved surprisingly easy. I thought I would try to stitch together the stars in the night sky in much the same way that one can stitch a panorama together. But Would Stitching Stars Work? To answer the question, I took the following 8 shots at high ISO, 30 seconds each. There is a peculiar and inexplicable bulge in the result, but it certainly looks quite a bit more realistic than the first try. It took about 5 minutes to do the stitching. in about 3 minutes. The ICE result is a lot closer to what I was expecting and the tool did not seem to object to having either the topsy-turvy or properly aligned images thrown at it. After cropping the ICE result and a little image clean up I arrived at the following visual conundrum. Which way is up? Well, the middle of the picture is up! The top and bottom are the East and West horizons. This entry was posted in Creativity, Image Stitching, Photo Tip, Review and tagged comparison, Image Composite Editor, Microsoft ICE, milky way, Photomerge, Photoshop, stitching on November 17, 2010 by Steven Christenson.